Mongol Heritage Foundation & Permanent Mission of Mongolia to the United Nation, Buryat House Organization in the NYC is holding third annual Tsagaan Sar celebration in Manhattan, New York. The celebration will be opened by H.E. Ambassador Od Och, Permanent Representative of Mongolia to the United Nations. The NYC Mongols New Year’s celebration “Tsagaan Sar” 2014 will take place on Saturday February 8th from 5:00pm – 12:00pm at “Select Space” event space where the Mongol tradition of “Zolgolt” will happen among the all Mongol people who live in the greater New York area. Tsagaan Sar is the Mongolian lunar new year celebration. It is one of the most important events for all Mongols .During this holiday people dress in traditional clothes, tell stories that transmit traditional knowledge, consume traditional dishes, play games, and practice customs that reinforce Mongolian identity, solidarity and continuity. Transmission occurs primarily within families. We encourage you to invite your friends and family to this exciting and interesting event where the New York Area Mongols will join together in a traditional celebration. Kalmyk, Buryat , Mongolian Buddhist monks from a Nitsan temple monastery New Jersey will also come to the event and bestow their blessings for the year of the “Blue Horse” by wishing you and your families’ success, good health, and happiness by reading Buddhist scriptures and distributing the traditional holy water. All of the Mongols including Buryats, Kalmyks, Hazaras ,Tuvans and Inner Mongolians are join in the celebration. Everyone who is interested in Mongolia and Mongol Culture is invited; people who are interested in Mongolia and the Mongolian Culture such as Americans who have lived and worked in Mongolia through the Peace Corps will attend. advance ticket $30 for adults, ticket on the door 40$ $10 for kids, and children under the age of 6 are free. Included: cultural show, presents, food,soft drinks: tea, sodas & juices. 6:00pm Buryat, Mongolian, Kalmyk Lama from Nitsan Temple will be conducted and the Monks will bestow their blessings praising of abundance, good fortune and long life. Southern Mongolian writer author Tumen-Ulzii Buyan-Mend, Enkhbat Toochig,U. Chuluun. * Kalmyk Musician , Morin Khuur Player , Singer Khongor Kekeev..
* Buryat Song Altargana NYC Buryat choir. * Yohor Hatiraya…Buryat Circle Dance. DJ Baagii Beatz is pleased to announce the music for NYC Mongols Tsagaan Sar celebration 2014. The music has a largely Mongol theme. Event organizers have put considerable thought into selecting the music, and their choices blend traditional music with some newly commissioned pieces. some ideas on what to expect and what you should do when you attend during Tsagaan Sar Event. 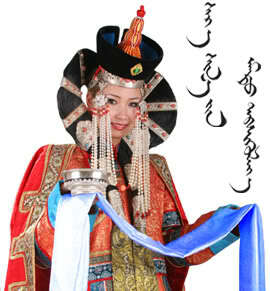 Dress-Many people will be dressed in full garment of national Mongol costumes. Men wear their traditional pointed hats; women wear hats or scarves during greetings. Mongolians treat their hats as an important part of the body. Hats are never seen on a floor or upside down: like the head, they should remain high. Khadag- During the greeting ceremony, guest will hold long, typically blue, silk cloths called a khadag In most cases, the people will also hold a hadag – a blue, or white scarf used for greeting each other, sometimes given as a present to old people to show respect. When greeting their elders-Greet the eldest person first. During the Tsagaan Sar, Mongols perform the zolgokh greeting, grasping them by their elbows to show support for them. The younger person holds up the older person’s arms, then the older person smells each side of the younger person’s head. Facing him/her, put your hands under his/her elbows like you are holding him/her. The older person will put his/her arms on top of yours. Likely you’ll press each of your cheeks against his/hers. Also people greet each other with specific greetings such as Амар байна уу? (Amar baina uu? ), meaning “Is there peace? After you greet the oldest person(s), sit down or wait. Younger people will come and greet you. You will put your arms on top of theirs when they greet you. When the greeting ceremony is over, everyone sits behind the table and starts exchanging “Khoorog” (a snuff bottle made usually of semi-precious stones and filled with finely pulverized tobacco). Exchanging Khoorog means expressing friendly intentions to each other and is usually the starting point of introducing a stranger. Exchanging Khoorog creates a warm atmosphere between people and makes the start of a friendly talk that helps to learn the true heart of the stranger. This greeting custom is that the people exchange their snuff bottles, offering them with open right hand while touching under the right elbow with the open left hand. Men have quite large bottles made of expensive stone, women’s are smaller. After receiving a snuff bottle a man will normally open it and take a pinch of snuff, sneeze appreciatively, then return it, but a woman should not open the bottle, she should just sniff the part-open cap and give it back. When they pass you snuff, smell it (don’t take lid off), and pass it on. Lid should be a little bit lifted – space between bottle and lid. Admire bottle. Receive bottle with palm up; pass on with palm down. Lids on side; won’t be upside down. Main important dish and drinks for the Tsagaan Sar event. Boov – biscuits made of flour – is the second main dish to be on the table. The biscuits are about thirty centimeters long and four centimeters thick, and they are stacked on a plate with each level laid out in a triangle or square shape. Layers have to be odd numbers – three, five, etc – as the odd numbers represent happiness. The older family members will get the higher the stack of boov. 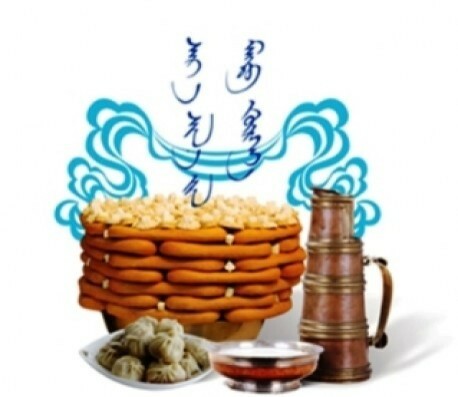 Tsagaan idée -dairy products such as cheeses and hard curds (these are white foods, to match the White Month) which would decorate the stack of boov, interspersed with small sweets. Uuts-Almost a whole sheep’s back, particularly with a big fatty tail – uuts – would be cooked for the Tsagaan Sar. Mongolians try to cook a sheep with as big a tail as possible, wishing the family wealth and prosperity. Mongolian Shagai game for Tsagaan Sar day. The most unique Mongolian game is shagai or anklebones, which as the name suggests, is played using the cleaned and polished anklebones of sheep. Each of the four sides of the anklebone represents a different animal: horse, sheep, camel, or goat. There are many games which can be played with the bones. In earlier times, families which managed to collect more anklebones than they needed would select an auspicious day and go to play the game of “multicolored turtle” on the top of a mountain leaving the bones afterwards as an offering to the mountain or to the sky. This game is played with a number of bones corresponding to one of the auspicious numbers in the Buddhist faith – most often 81 or 108. The placement of the bones represents the five elements and colors in addition to the body of the turtle itself, which is viewed in traditional Mongolian iconography as the symbol of the cosmos. Players take bones from different parts of the turtle or surrounding five elements on each turn corresponding to the throw of a die. Once the players have collected all the parts of the turtle’s body, the game concludes with the player in possession of the most bones the winner.